EABASSOC Flashing Tape is a self adhesive tape, comprising of an aluminium foil backed by a flexible modified bitumen adhesive compound. It is used for the repairing of gutters, pipes, joints, glazing systems etc. 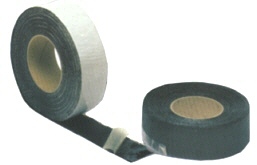 EABASSOC Flashing Tape is used both in construction, maintenance and for emergency repairs. It is used to seal valley gutters (where it is used as a lining even over cracks and holes), to repair gutters and downpipes, for the sealing of joints and projections through roofs (e.g. vents, pipes, columns etc) and for stopping leaks in glazing systems in factory roofs, greenhouses etc. EABASSOC Flashing Tape is supplied in handy rolls packed in easily portable cartons. It is easy to apply, and is available in a variety of widths (from 50mm to 600mm) and colours (bright aluminium, lead-grey aluminium, red and white finishes). It is ideally suited for use in the preparation of roofs before the application of an RBC or other liquid applied system. It is used extensively to cover cracks, holes and joints in metal roofs before the application of RBC Aluminium protective coating. Additionally, it can be used for sealing and glazing roof lights and protecting strip glazing. It will protect metal, brick, concrete and exposed waterproofing membranes against weathering and corrosion.